The Caravan® Sports Disc Fan Light is great for camping, hiking, or any outdoor activity. Consisting of 39 independent LED lights, a two-speed fan setting, and a USB charger, this 3-in-1 multifunctional outdoor combo can illuminate a space, keep you cool, and charge your mobile device. It is powered by a built-in rechargeable battery that lasts up to 24 hours. 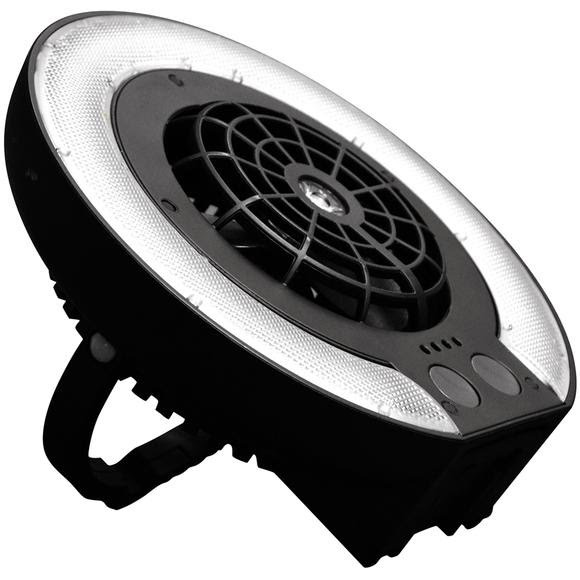 The Caravan® Sports Disc Fan Light is great for camping, hiking, or any outdoor activity. Consisting of 39 independent LED lights, a two-speed fan setting, and a USB charger, this 3-in-1 multifunctional outdoor combo can illuminate a space, keep you cool, and charge your mobile device. It is powered by a built-in rechargeable battery that lasts up to 24 hours. This device has a handle and hook, so simply hang it from a canopy or tent to use it as a ceiling fan/light, or stand it on its base to use on any flat surface.